Back in August, we reported that Pelgrane Press’s new space opera RPG Ashen Stars had won a 2012 ENnie Award for Best Setting. That was enough to pique my curiosity, and I ordered a copy. 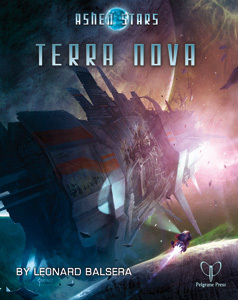 I’ve been waiting for a science fiction role playing game with a truly rich setting for a long time. Our Managing Editor Howard Andrew Jones has been exploring Traveller in a series of occasional articles — most recently on the Netherell setting and The Third Imperium — but to be honest I always found the setting for Traveller to be fairly generic, at least in the early editions. The last SF RPG to really impress me was Rogue Trader by Fantasy Flight, a gorgeously produced game set in the Warhammer 40,000 universe; before that I have to go all the way back to Holistic Design’s future-medieval setting Fading Suns, first released in 1996. I’m very pleased to be able to add Ashen Stars to that short list. 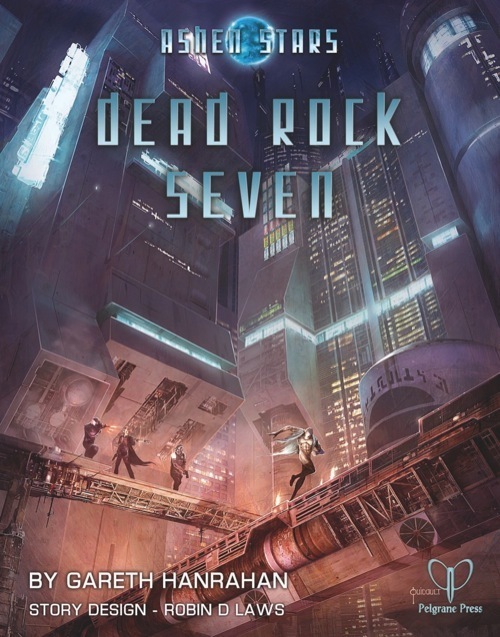 Drawing heavily upon his successful GUMSHOE mystery system, author Robin D. Laws has created an extremely appealing game of space opera procedural mysteries. In the tradition of the best hard boiled detective fiction, players are constantly scrambling for money, equipment, and respect… all of which they’ll need to succeed in a war-ravaged perimeter where trust is a precious commodity, and very little is truly what it seems. The players in Ashen Stars are private eyes — excuse me, licensed mercenaries — acting as freelance law enforcement on a rough-and-tumble frontier called “the Bleed,” where humans and half a dozen alien races mingle, compete, and trade. The Mohilar War that devastated the once powerful governing Combine ended seven years ago, and no one is sure exactly how. The Combine is in no shape to govern the Bleed, and rely on loosely-chartered bands like the players to maintain peace in the sector, keep a lid on crime, and investigate odd distress signals from strange corners of space. Like the crew of the Serenity, your loose band of players operate on both sides of the law, secure lucrative contracts, scramble to maintain your ship and upgrade your aging equipment, and maintain a code of honor in a place where reputation is the most precious commodity there is. The writing and color art are impressive throughout, and the book is filled with fascinating tidbits that will make you anxious to play, and re-introduce you to the essential joy of role playing. Seventeen years ago, it began — a period of unprecedented destruction, courage and suffering. The characters remember some of its terrifying moments with adrenalinized clarity. Others — those involving direct contact with the enemy — remain maddeningly hazy and elusive. The Mohilar War, which shattered the Utopian era and left the core worlds of the Combine in ruins, comes to mind less as a narrative than a series of fragmented bullet points. The Mohilar… appear in great numbers, operating ships of unprecedented size and firepower. They plow through rival empires white cutting their swath toward Combine space. They completely annihilate the chanovar and drive the illud to the brink of extinction… The Combine stands on the very brink of extinction. Then something happens. Something nobody can remember. [The durugh] king sacrifices himself to decisively betray the Mohilar, perhaps after discovering Mohilar plans to betray the durugh. Before he dies, he throws in his people’s lot with the Combine. Then whatever the thing was that happened, finishes happening. The Mohilar are not only gone, they’re erased from everyone’s memories, and from everyone’s ability to process information about them. We think. Player: But what about physical records? I can see how everyone’s memories might be affected, but what happens when I access the database and type in “Mohilar”? You: Do you do that? Player: Well, I must have done it before. Everyone must have tried this. Player: I’m asking you! You’re the GM! You: Sorry, what was the question? Player: So if right now, I go to the console and tell it to give me everything in the database about the Mohilar, what happens? You: Later, you find yourself sitting in the mess hall. You’re thirsty and your head hurts. Player: So when I checked the database, was there nothing there, or was I unable to perceive it? Player: Wait — am I missing time? Did I give myself an amnesiac spell by reading the file? You: You have no reason to believe that there is a file. The riddle of the Mohilar is by no means the only mystery teasing the players in Ashen Stars. Laws has peopled the Bleed with a fascinating mix of human factions, alien races, and stranger things — each with their own history, motivations, quirks, and secrets. The players will encounter Durugh spies, hired killers, gangsters, pirates, miners, rival mercenaries, vigilantes, warriors, and odder things as they accept commissions and put their mark on the Bleed. The Ashen Stars rulebook contains detailed rules for space combat, 14 types of spacecraft, a rogues gallery of threats to menace your players, and a 21-page sample adventure featuring a deranged museum artificial intelligence trying to re-create some of the deadliest battles in Combine history. Typical for Pelgrane Press, they’ve also supported the game with a fine line of supplemental adventures (including Dead Rock Seven and Terra Nova), and even a music album, All We Have Forgotten. A complete list of supporting titles is available on the Pelgrane Press website. Ashen Stars contains material adapted from Pelgrane Press’s well-regarded RPG of Lovecraftian horror, Trail of Cthulhu, by Kenneth Hite. 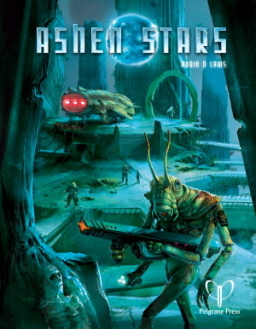 Ashen Stars was published in 2011 by Pelgrane Press. It is 298 pages in an oversized, full-color hardcover. The retail price is $44.95, and the price includes a PDF version. Robin’s work has been must-buys for me for years. Its a fascinating universe he has built for the game. Agreed. Robin D. Laws has produced some terrific RPG products, including Dungeon Master’s Guide II. Jack Vance’s The Dying Earth Roleplaying Game, Earthdawn, and many others. He’s also got over half a dozen novels to his credit, although I haven’t had the time to try those yet. John, this is a great recommend. I’ve paged through the rulebook and it has the answer to a lot of gaming problems my group and I have had in the past. One faction loves the clue finding and mystery and the other likes as much action as they can get. The trouble has always been a campaign that allows for both and it often comes to a couple of characters getting the action while the others sit around and watch. This game looks like a good balance between the two and gives everyone a piece of the action no matter what the setting. I like the gumshoe rules. Brilliant idea. We tried a Firefly type campaign but it fell flat. I think this will do a lot better. Also there are CDs with theme music. Very cool music to put the group in the mood. I can’t wait to spring this campaign on the group. Glad to hear it! I was tempted by the CD, but haven’t tried it… if you do, let me know what you think. And be sure to report back if you get a chance to use Ashen Stars with your regular gaming group. I’d love to hear the results.